Some typos are bigger than others and this is one example. No matter your profession, you want to strive for perfection but you know that everyone is going to make mistakes. That’s especially true in media and in PR where even the best of us makes the occasional mistake. And when that happens, you just hope that it’s not something huge that inadvertently says something you don’t want to say. 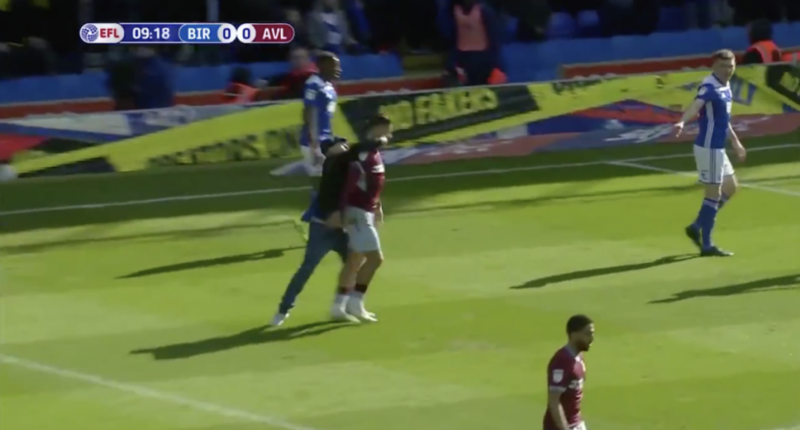 In the Birmingham Derby, a Birmingham City fan ran out onto the pitch early in the match and assaulted Aston Villa captain Jack Grealish. The fan punched Grealish from behind, taking him down, while security apprehended the person. West Midlands Police announced they arrested the fan and are reviewing video from various sources to plan their next move. This comes at a time where there has been a rise in knife attacks within England. In a situation like this, every entity involved is going to get ahead of this and release a statement expressing some form of condemnation of what happened. The two teams, Aston Villa and Birmingham City released similar statements in addition to an apology from Birmingham City. The English Football League, the organization that runs the three leagues beneath the Premier League in England, put out their own statement. It would be easy to overlook the typo in the first line where it says, “The EFL condones the mindless actions of the individual who encroached on to the pitch at St Andrews on Sunday afternoon.” Obviously, reading the rest of the statement, the EFL clearly meant “condemns” and they corrected their statement to say that but the unfortunate typo is a reminder that some typos are massively bigger than others. Fortunately, Grealish would continue to play after the attack. In fact, the Villa captain scored in the 67th minute and give his team a 1-0 win. This will surely be a pivotal moment in how soccer organizations deal with fan behavior. Before the 90s, hooliganism and racist chanting was rampant throughout England and while it may not be as bad now as it was back then, there’s a realistic concern that something needs to be done now rather than waiting until it gets to the point of how it used to be because by then, it’s much tougher to get the genie back into that bottle. We laugh when some drunk runs out on the field or are touched when a fan (sometimes a kid) runs out to try and get a selfie with their favorite player. It only takes one time until we have a Monica Seles type situation and by then, it’ll be too late. Thankfully, since the Grealish assault wasn’t as bad as it could’ve been, soccer organizations have an opportunity to be proactive rather than reactive. Let’s see if they actually follow through on this.